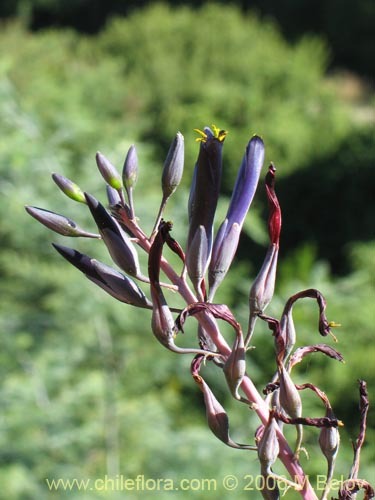 Описание и фотографии Puya coerulea var. monteroana (Chagualillo), дикорастущего чилийского растения, представлено Chileflora.com, Вашим поставщиком семян дикорастущих чилийских растений. Около 10 Puya в Чили и 8 в нашей базе данных. Около 30 Bromeliaceae, Бромелиевые в Чили и 22 в нашей базе данных. 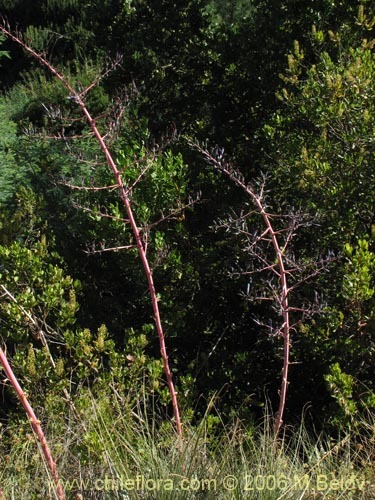 This is one of those all-terrain "exotic" Chilean plants which is relatively easy to grow and is suitable for a wide variety of environmental conditions. Its limiting factor is that it does not tolerate prolonged freezing temperatures and snow cover. 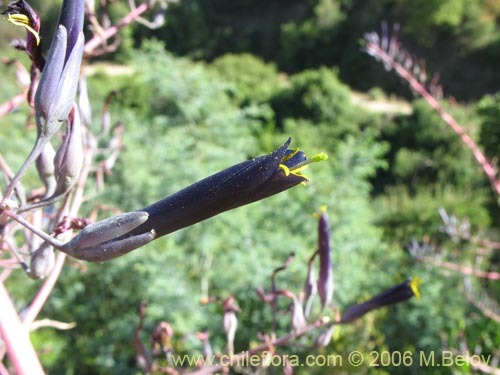 Its red stem and branches make a nice contrast with the dark-purple, almost black flowers with their yellow stamens and green pistil, and it preserves its strange appearance when covered with fruits, which are reminiscent of garlic cloves. Высота: 1000-1500 m. 26/01/2006 г. This is a perennial shrub which grows to about 2 m. The stem and the branches, which are disposed in a spiralling manner, are red-colored. The leaves are long, about 50 cm. and grow at the base of the stem. 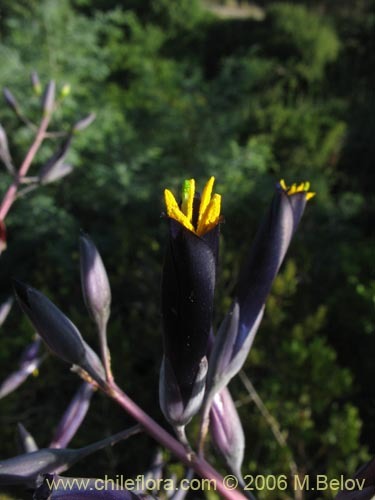 The flowers consist of 6 dark-blue, almost black petals, with 6 yellow stamens and one green pistil. The fruit is a capsule of about 3 cm. long, full of small seeds with short wings. The plant blooms in December - January and the fruits appear in February - April. 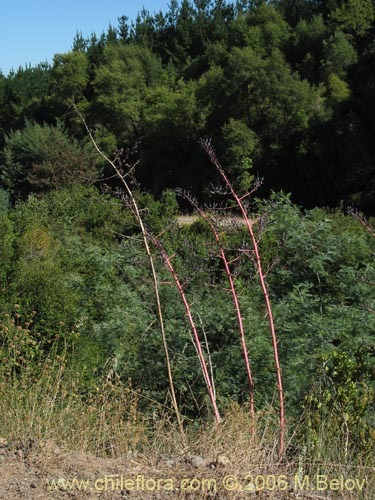 This plant grows at lower elevations, but in the mountains, in dry, rocky places, usually facing north (i.e. sunny sides in southern hemisphere). It does not tolerate well temperatures below 0ºC, but withstands easily occasional freezing spells ofup to -3º to - 5ºC. Здесь можно помотреть больше фотографий Puya coerulea Miers var. monteroana (L.B.Sm & Looser) L.B.Sm & Looser , еще 9.